This chart shows the monthly health care premiums for a friend of mine in the US. They are now $1,700 a month with a $7,000 deductible. There are 2 adults in their 40’s and a 4 year old child. All have excellent health records. As you can see this chart is exponential. It is likely that the increases in the next 5 years will accelerate even further. How will this family cope? How will you cope? Now let’s look at how the healthcare costs of Canada’s smallest province are growing (The current data is taken form government sources). It’s the same curve. The red bars are PEI’s tax revenues. 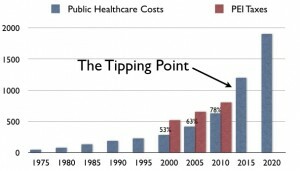 Health costs are 78% of current tax revenues. Only the $600 million subsidy from the Feds keep PEI going. In 2015 it is likely that health costs will equal PEI’s tax revenues. By 2020, it will be double. PEI is the canary in the mine. Canada’s larger provinces will take a bit longer but the trends are the same. 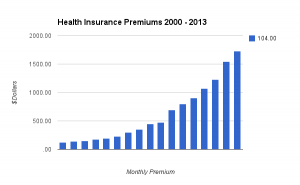 Individuals and even states cannot live with the rate of increase of health costs. Nor can they live with the results. For the epidemic of chronic illness is getting worse and lies on the same trajectory. At the moment, all the hopes are set in somehow reducing waste and ion increasing efficiency. I don’t think we have tome for this. The crunch is here now. And even if we did and could find 30% in savings, it does not challenge the curve. The model is wrong. Fix when we are ill is the wrong model. Personal Health will replace this quickly, just as personal news and music replaced mass market news and music.